10:03: Waiting for the start of events - we're in a huge room stock full of people. This is going to be the keynote address for GDD - Outside in the lobby was a registration area made to look like the Googleplex. Foosball tables, beanbags, candy, food, drink, coffee, toys, and more. No bag of swag like I heard other GDD locations got. Maybe that will be later. 10:11: Jeff Huber, VP of Engineering up first. Thanks to Googlers from around the world for making this a great event. Broadcasting this to the European locations. Talk about all the locations holding the GDD. 1500 people here at San Jose, and over 5000 worldwide. All the events are completely free including free food! Talk about the growth of the developer community and products from Google. 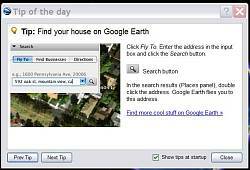 The introduction of Google Maps in 2005 was a big influence on Google's strategy for openng up APIs for Google products. In 2006 introduced 10 APIs or toolkits. 10:25 Google Mashup Editor - Paul McDonald - Experimental new product - simple tags and HTML for creating Google Maps and other Google products to produce a mashup. Comes with an editor, and a testing "sandbox" so you can verify your tags are working before you publish it. 10:32 Google now has over half a Billion people visit their network each month. 10:33 Google's Gadgets - Popular examples: PacMan v2.4 generated 6.4 Million page views last week. ToDo generated 4.7 million pageviews for its developer last week. He's advocating Gadgets can drive a lot of traffic to your site. Soon you will be able to put gadgets in all kinds of places. 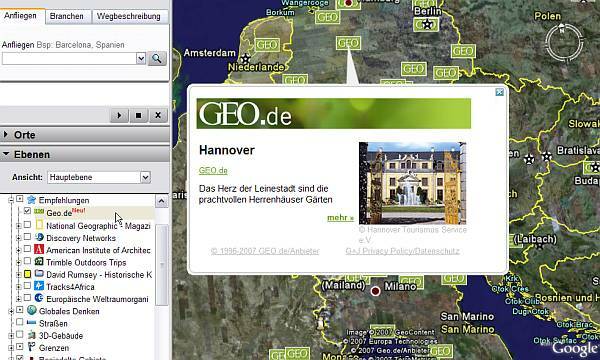 10:36 Google Mapplets - One of the top queries is hotels. Orbitz is building a Google Mapplet gadget to allow you to search for hotels. Then showed Weatherbug overlayed over the Orbits hotel layer. You can do a search within a picked location and get a local search for other information like dining, parks, etc. Google Mapplets is a mashup of mashups. 10:40 Google Web Toolkit - lets you do development in Java and compile it into Ajax that is compatible with the various browsers and OSes. 10:41 Google Gears - Offline access for web apps, cross browser and cross-platform, open source; Google wants this to be an industry standard. Google Reader offline is first. Gave a demonstration of this, but had a bit of trouble telling the computer to go offline (and to convince the browser to show he was off line - had to disable the cache). He jokingly stated we need an easier way to make our computers disconnected! 10:54 End of the Keynote approaching. I have to say I'm really disappointed on the lack of anything being introduced or even talked about regarding Google Earth. Big disappointment from a Google Earth perspective so far. There is certainly a lot of cool stuff from Google - but, where is the Google Earth news?? 10:55 Sergey Brin up next. Amusing line of thinking about the Internet generating new Internet kids who will be developing the future of the Internet going forward. Thanks to developers for making the Internet a great place. It was a real pleasure meeting so many GEB readers, and I thank all of you for giving me your card, and for reading the blog. I will have more posts about Where 2.0 after I have a chance to either digest the information, or time to explore the new applications or web sites I learned about. Tomorrow is the Google Developer Day, and I'm still hoping for some interesting Google Earth announcements of either new data, or new versions of Google Earth. He started off by asking us to listen to a strange whistling noise and asking the audience what it was - "A Tricorder" shouted several. Sure enough, he revealed he was holding a "real" Star Trek tricorder. Michael said this device served as part of his inspiration for helping create Google Earth. Next he showed an autographed photograph of one of the aliens in Star Trek who Michael spoke to that is now a big fan of Google Earth. Next he showed photographs of the current and "retiring" leaders of the world: Chirac, Tony Blair, Bill Gates, and George Bush - once again all quoted as being fans of Google Earth. He also showed the "Leader of the other world" - Jack Dangermond (CEO of ESRI - GIS leading software maker). Next he suggested we should name Angelina Jolie the Where 2.0 Honorary Celebrity of the year for tattooing lat/long coordinates on her arm showing the birth locations of her 4 kids. He revealed Google Maps now has little markers indicating metro subways and other information in major metropolitan areas are now clickable with more information. He showed Hyderabad, India's Google Map has user-contributed information showing the locations of things like water tanks. He next mentioned the new Google Maps StreetView and Google Maps Mapplets technology and showed how Mapplets can do some really cool things. He made sure to show that you can easily convert your Google Maps Mashup into a Mapplet and add it to the list of available applets through a simple form. (URL later). He showed how Barry Hunter of Nearby.org.uk actually implemented a Mapplet yesterday. Finally - he demonstrated a real live iPhone with Google Maps on it showing both maps and aerial photos. You could hear the sound of drool falling from the mouths of the audience. A very cool presentation! I wish I had video of it - hopefully Where 2.0 will post a video of it soon. Michael Jones - CTO for Google Earth - just made a presentation at Where 2.0. He announced that Google is acquiring Panoramio - the photo hosting company which has been using Google Maps and Google Earth to allow people to upload, geotag and share the location of their photos. 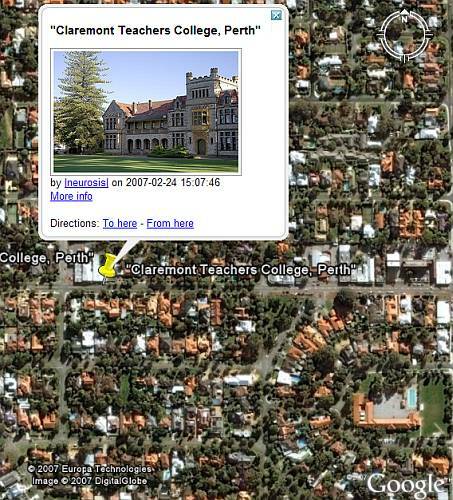 Google first demonstrated their interest in Panoramio by adding them to their Geographic Web layer inside Google Earth. This was such a successful addition to Google Earth that over a million photos were added to Panoramio in less than 5 months. This clearly demonstrated the powerful usefulness of tying photos into the geospatial domain, so Google has decided they should bring that capability in-house. Congratulations to Joaquín Cuenca Abela and Eduardo Manchón Aguilar who co-founded Panoramio! [UPDATE] Here is a blog post from the co-founders of Panoramio about the acquisition. And here is John Hanke's Official Google Blog post on the announcement. It turns out the Panoramio Guys were at Where and e-mailed me after I posted this. We got together for a little celebrating of their new relationship with Google. Here is a photo I took showing three of the guys from Panoramio. Eduardo is closest on the left. Next to him is Luisxto from Tagzania, then Diego of Hipoqih.com, then Joaquín of Panoramio, Jesus of Activasat.com in the back. On the right is Mickey Mellen (behind the post) of Google Earth Hacks, to his right Virgil of EarthNC.com, Jose of Panoramio, and Gari of Tagzania. Cameras - New tags which will enable us to set up a camera in KML so you can rapidly change the camera view to better view the 3D content inside Google Earth. PhotoOverlay - New support for placing photos in the Google Earth scene. Support for different types of projections of photos including spherical panorama photos. Combine this with the camera views and a SpaceNavigator and you'lll have capability to better view photos inside GE. Further, I wonder if this is laying the groundwork for other ways of viewing the new StreetView photos just released for Google Maps. Network Link Session Length - Google has added a parameter for controlling the maximum session length. Placemark Info windows - much better control for href tags for KML/KMZ in info windows - you can force KML/KMZ interpretation for non .kml or .kmz extensions for dynamic fetches, also allows explicit 'pops' of other info windows via # reference. This has some very interesting user interaction capabilities - Thanks to Virgil Zetterlind for this item. <resourcemap> in the model tag - would appear to allow for dynamic 'skinning' of models - maybe we're close to the video viewer. Another observation from Virgil - I hope he's right on this speculation. Otra cosa sobre las Vistas de Calles. Esta tecnología viene de una compañía llamada Immersive. Esta no es la tecnología que se estuvo rumoreando esta semana acerca de la adquisición de datos de edificios 3D utilizando tecnología robótica de la Universidad de Stanford. This is just a quick summary of some of the other important announcements made so far today which are Google Earth-related from the Where 2.0 Day 1 events. More details will come tomorrow morning when I have a chance to report more fully. Google Maps Mapplets - The announcement presentation by Google this morning was cut short, the portion of the announcement related to Mapplets was not covered fully. This new capability could be particularly significant. 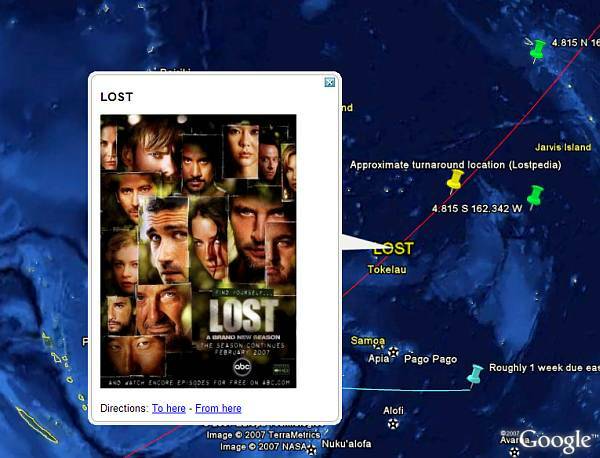 It allows you to compare different Maps mashups together collectively. See some details at the Google Lat Long blog. To put this in Google Earth terms - it is like adding your own layers of content on top of Google Maps (just like the layers or your own Places layers work in Google Earth). Turn them on and off selectively. Also, you can add KML files to the mix. I'll be talking more about this soon. Sounds for Google Earth - We finally got to see - actually hear - the new KML content from Wild Sanctuary. It is a file which lets you visit locations around the world and hear soundscapes collected by Bernie Kraus who has been collecting sounds for locations around the world for 40 years. He has 3500 soundscapes, and 15,000 sounds of different animals from around the world. You can now visit their new site and try it out yourself at: http://earth.wildsanctuary.com/. Garmin - Garmin has announced Garmin Developer - developer.garmin.com - and a number of new services to enhance the ability to interface their GPS products with mapping applicatins. They have developed a communication API to allow software applications and mapping tools to tap into your GPS data. They are leveraging technology and talent when Garmin acquired MotionBased.com . Several people I spoke to at Where are excited about the possibilities these new development interfaces could enable. Virtual Earth - Microsoft's Eric Jorgensen shared some information about Microsoft's Virtual Earth application and data. He said Microsoft's objective is to offer a fully realistic representation of the entire World. The camera technology Microsoft acquired through the purchase of Vexcel is the reason they have been able to acquire high-quality aerial photography and Bird's Eye views at such a prodigious rate. These cameras are critical for their mostly-automated 3D building creation system. They now have 100 cities in 3D, including New York City, and plan to have 500 cities by next year. Also shown were the MapCruncher for creating overlays, and the research tool Photosynth which enables 3D creation from ground-based cameras. Some pretty exciting building interior shots were shown. Their primary focus in on accuracy, realism, and scale. My initial thoughts: the more data the better! I hope this keeps the pressure on Google to create even more inspiring data themselves. 3D Data Panel - I wish this panel could have been longer - On the platform were: Mike Liebhold - IFTF.org, moderator; Michael Jones - CTO of Google Earth; Steven Lawler - Microsoft Virtual Earth; Don Cooke, TeleAtlas; Jack Dangermond, ESRI; and David Colleen, Planet 9. Lots of talk about how important adding the third dimension to the GeoWeb is critical. 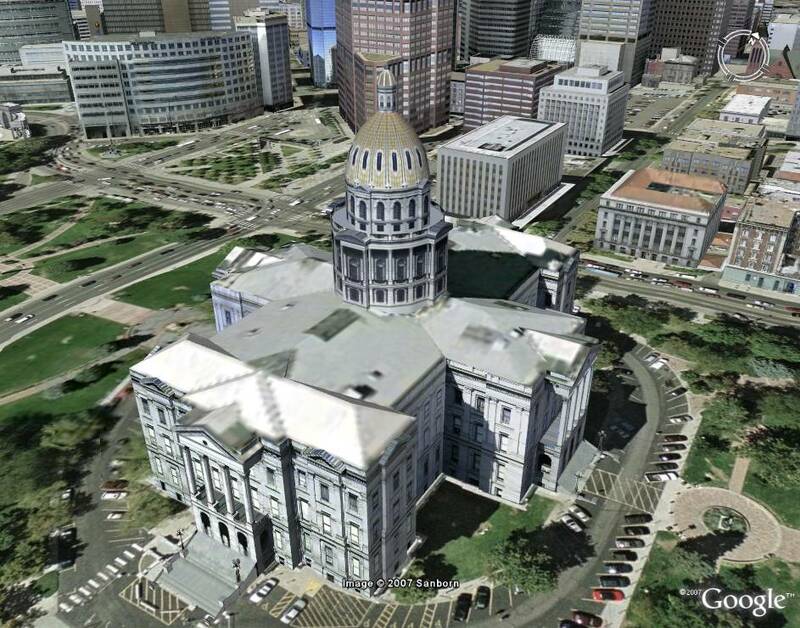 Microsoft and Google both discussed their approach to acquiring 3D data of cities. Planet 9 announced a thing called Raygun which is their own SecondLife-like 3D world of the real world - including building interior modeling. There was discussion about the importance of being able to take the data models used by these various competing data resources and being able to share that data with other applications. Google made sure to emphasize their introduction of KML to the open standards process through the OGC, and their support of the Collada file format standard for their 3D models. Microsoft pointed out their support of a plug-in architecture will enable alternative 3D renderings to allow more realistic special effects. Unfortunately they ran out of time and the planned Q&A session didn't happen. [Actualizado: 1130 PT] John Hanke de Google acaba de anunciar en la Conferencia "Where 2.0" la nueva y grandiosa característica para los Mapas de Google. Está solamente disponible en cinco ciudades de Estados Unidos (San Francisco, Miami, Denver, Las Vegas, Nueva York), pero definitivamente vale la pena experimentarlas! Debes tener por lo menos la versión 9 de Flash instalada para poder usar esta nueva característica. Te permite ver imágenes a nivel de la calle basadas en fotos sacadas desde un auto en movimiento. Las fotos son de alta resolución por lo que tienes disponibles 16x de aumento y te permiten ver hacia los costados o acercarte a detalles. John mostró un ejemplo donde, en un estacionamiento, podía leerse el cartel con las tarifas y si era público o privado. Adjunto una captura de pantalla de una vista cercana al Puente Golden Gate. Lo más interesante de esto es que puedes agrandar y recorrer la imagen. Puedes también arrastrar el ícono del hombrecito para llevarlo a otro lugar. Amazon había hecho algo parecido llamado los Mapas A9, donde tenían fotos a nivel de la calle. Pero la interactividad y los niveles de zoom que Google implementó son muy superiores. Las posibilidades son que Google haga esto más popular. No hay comentarios acerca de si ésto está relacionado con el anuncio de una licencia de Stanford de fotografía robótica para hacer edificios 3D. También se anunció las "Google Mapplets". Más detalles en el Google Lat Long Blog. Esto te permite crear mezclas de mapas rápidamente. Puedes seleccionar varios mapas a través de botones. Utiliza una Google Gadjet para agregar a la interfaz de los Mapas de Google una nueva pestaña. Aquí hay una pre-vista . SpaceNavigator Drawing - If you give me your business card at Where 2.0 today or tomorrow morning, Google Earth Blog will be drawing one card randomly to give away a free 3DConnexion SpaceNavigator (one card per person please). Here is a photo of what I will look like today - wearing my Google Earth t-shirt. Hopefully there won't be too many other folks wearing the same shirt. 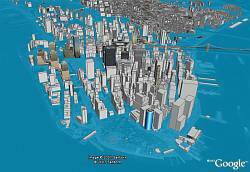 New York City in 3D - Microsoft has announced they are releasing New York City for Virtual Earth 3D. A shrewd move announcing this at the start of the Where 2.0 conference where a lot of buzz will likely be generated. Definitely something to check out with a SpaceNavigator - unfortunately I'll have to wait until I get to a box with Windows on it since I've got my Macbook with me for this trip. Virtual Earth still only runs on Windows. I'll be traveling all morning Monday on my way to San Jose, California for several meetings and conferences starting with Where 2.0. Monday night, Where kicks off with some product launches and rapid fire 5 minute presentations - called Ignite. Read more about Ignite and Launchpad. I will be blogging all during Where - through Wednesday - so watch this blog for any Google Earth-related news or announcements. At a minimum I'm expecting we'll see some new imagery and layers for Google Earth, and I'm also hoping some new features for Google Earth will be announced. It should be an exciting week! 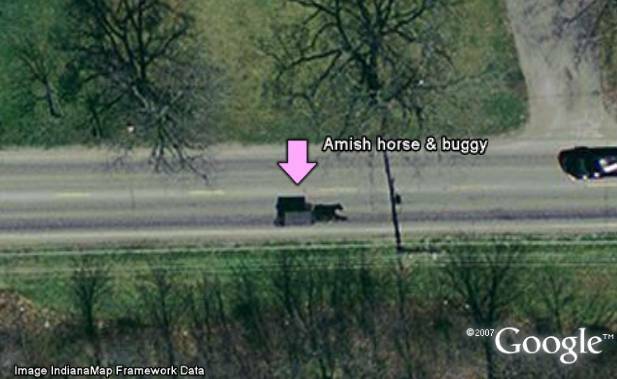 A few days ago someone posted a nice shot of a horse and buggy at the Google Earth Community. The poster, called 'bellenarcissa', said there are Amish living in this area of Indiana - who still use this for their primary transportation. Then, other GEC members found several other horse and carriages around the area. One of the posters discovered a large store with numerous horse and carriages parked outside. Turning on the GEC Community layer while looking at the store, we find it is the "Town & Country Hardware" store which is located in Shipshewana, Indiana "Heart of the Northern Indiana Amish Country". Here is a collection of the placemarks from the thread showing all the horse and carriages and the hardware store. Google has posted more details on the big upcoming Google Developer Day (<- follow the link for full details). They are expecting over 5000 developers to attend in 10 countries. Fully 1000 have registered for the Mountain View/San Jose event, which has been moved to the San Jose Convention Center to accommodate the throngs (many of which will be coming from Where 2.0 which ends the day before). There will be three tracks. The one of primary interest to GEB readers will be the "Developing with GEO" track which includes sessions on SketchUp, Maps API, KML, Maps Mashups, KML Search, and more. They will be providing transportation, after the sessions, over to the Googleplex for some food and entertainment. This will be fun! Also an important note: if you can't be at Mountain View in person, you can still watch it live thanks to a Live Webcast being pushed out by Google. And YouTube videos will also be available for sessions held in other countries. Yours truly will be there in person and live blogging during the event. Angelina Jolie has been getting attention from the geospatial community recently because of a new tattoo on her arm. Her tattoo is a simple list of lat/long coordinates showing the locations where her four children were born. Google Sightseeing blog just posted about Angelina's tattoo, and included placemarks showing all four locations in Google Earth. Just this week, Google Earth Blog (GEB) crossed the 1000 posts mark! That's 1000 posts since August of 2005. 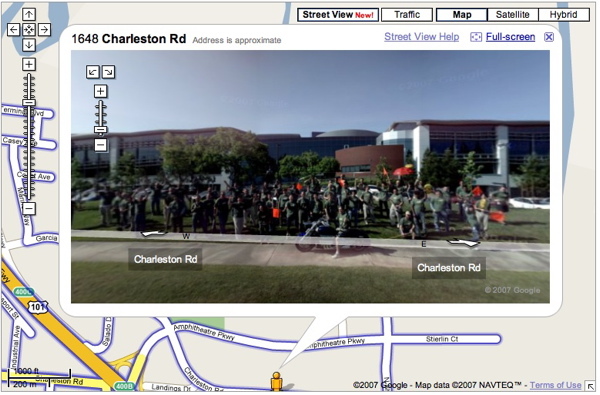 It's been a lot of work, but I really enjoy covering what's been going on with Google Earth. It surprises me, with all the time I've spent doing this, that it continues to be interesting and exciting to see all the new capabilities and new content available. And, I see no signs of the pace slowing down. This is my first blog. I started it as an experiment to learn about blogging, and it's turned into a career. Special thanks to the Google Geo Team, my fellow bloggers in the geospatial arena, my ad sponsors, Google Adsense, and most importantly - all of the GEB readers! A special note of thanks goes to Adsense, which is a truly valuable service which keeps many bloggers dedicated to their work. I'm planning to continue blogging GEB at least for the next few years, if Google Earth continues like it is - and assuming my readership stays large enough. But, I do have some other little projects in the works to keep my entrepreneurial spirit happy. And, one of these days, I hope to finish a redesign for Google Earth Blog. Google is looking to conduct "User Experience Research" involving Google Earth. Fill out this survey form to help them decide if you meet their needs for the real study. They will either have you fill out an online survey, or participate in a focus group or in-person interviews. According to the FAQ, you could get paid if they select you to participate! Starting next week GearthBlog will be written from California for two weeks. I'm attending several important Google Earth-related events: Where 2.0, Google Developer Day, and the International Symposium on Digital Earth. The Where 2.0 conference is probably one of the most important meetings of the year for developers of new Web 2.0 mapping technologies. The Google Developer Day is the expanded version of last year's event where Google made several big announcements for Google Earth (GE 4, huge amounts of new imagery, and other data all released in honor of GE's birthday). And the ISDE should be a very interesting mix of folks from all over the world interested in using these technologies with a focus on Earth. While I'm attending Where, I plan to give away a free SpaceNavigator. The 3D mouse which, in my opinion, is the best way to use Google Earth (or any virtual globe). Here's how it will work: if you are a Google Earth Blog reader and you see me at Where 2.0, make sure to give me your business card (one card per person!). On the afternoon of the second day, I will randomly draw a card and will post the winner on my blog. If you're still at the show when you find out, I'll give it to you there. Otherwise, I'll mail it to you later. Anyway, I'm hoping to meet lots of GEB readers during the trip. I'm expecting many new announcements from the Google Geo team during these events. New satellite imagery, new 3D building technology, new layers, and who knows - maybe they'll announce GE 5? Just a month ago I speculated whether Google might be considering localized layers when they did the French Elections layer. In that case, it turned out I had mistakenly not selected "All layers" in the Layers View parameter. But, this time you can only see this layer in the German version. My guess is this is because the web site is German only, so it doesn't make sense to convert the layer over to other languages. If anyone sees other built-in layers which are only available in a non-English version, please contact me or leave a comment here. Since this blog is obviously focused on Google Earth, I have not devoted a great deal of attention to Microsoft's new competing product: Virtual Earth and, specifically, Virtual Earth 3D (VE3D). However, Microsoft has been making significant progress with their application (still in beta) and especially their data, so I feel I should at least share some of my thoughts and observations in comparison to Google Earth. I will be sharing some video, screenshots and a table of comparisons in this article. Please take note my bias is towards Google Earth (GE), but I've tried to be fair in my comparisons. And also, the focus of this comparison is from a user perspective, not a developer. Huge amounts of new data. Aerial photography, and Bird's Eye views for many new cities in Europe and the US, about 30 more full cities with 3D building data, and more cities with road layers. Although Microsoft still does not have nearly the amount of coverage of the world with high resolution aerial photos as Google, the amount of data they have added is significant. The Bird's Eye views in particular add several times as much photography for a given city as the standard straight-down views. 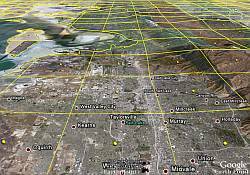 So, for any given city where Microsoft has Bird's Eye views they have more aerial data than Google in those cases. And, Microsoft is adding cities with this data at an amazing rate. Especially when you consider that it costs many millions of dollars to fly, photograph, process, store, and deliver this amount of data. The 3D building data sets are also very impressive. Being able to automatically generate 3D buildings has some advatages and disadvantages (see some earlier comments and video I've written about). The advantages are being able to have a vast majority of buildings modeled, and be able to generate more cities with this level of detail at a better cost per city. The disadvantage is that the level of detail and accuracy (at least currently shown) in VE3D is lower quality when examined closely. 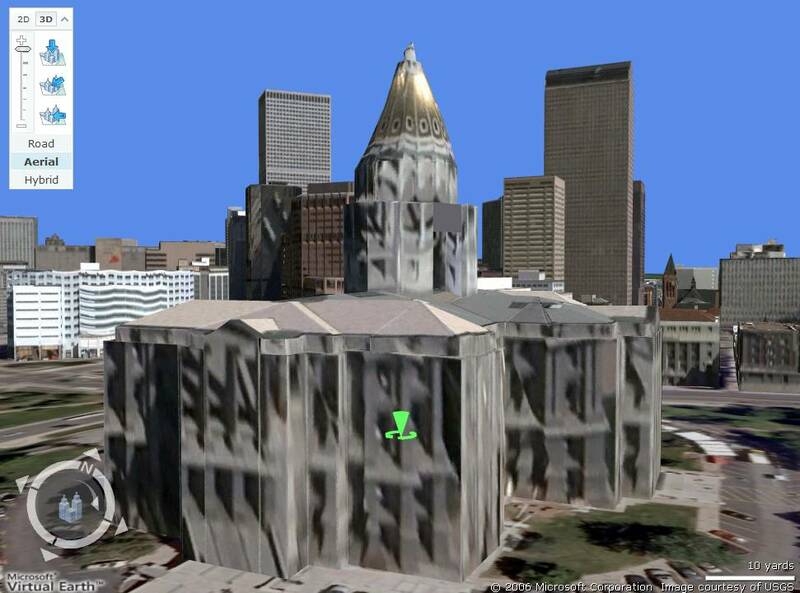 Here are some screenshots of 3D buildings for comparison between Virtual Earth and Google Earth. I realize some of you will say I'm not making fair comparisons here, but read on, I try to summarize my comparisons fairly in the conclusions. Click on the thumbnails to see full details. 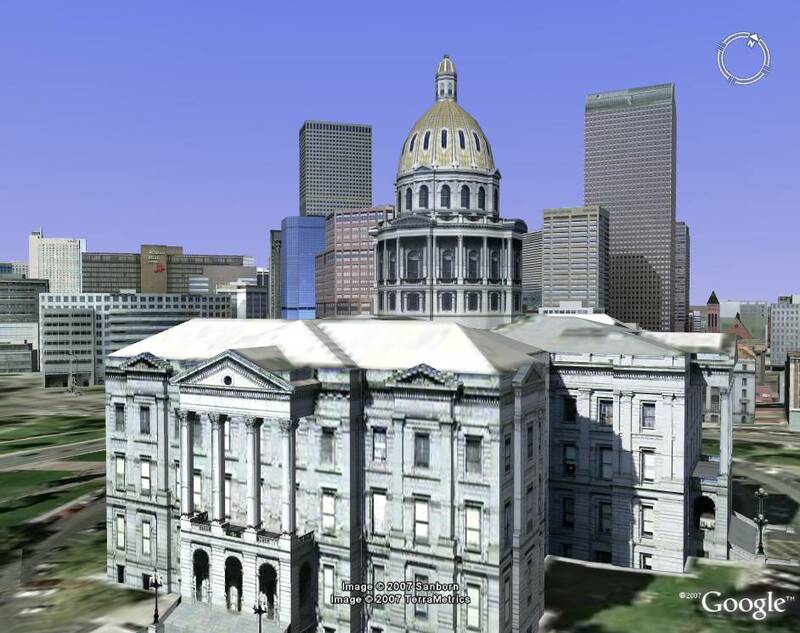 First we compare the Denver, Colorado capitol building in Virtual Earth (autogenerated) to the hand-built building in Google Earth. This example illustrates some points. Next we have the same building with the cityscape in the background and closer-up view of the building. Note that the auto-generated textures in VE3D do not look very good up close. Meanwhile, there is a great deal more detail in the hand-made GE model (especially if you zoom in close). Part of the problem with the VE3D view is due to Microsoft's decision to not load too many texture details because they take up a lot of memory. On older machines, Google's approach will greatly overload the system causing much slower performance. However, on newer machines, Google's performance actually is faster even with a heavily detailed number of building models like found in Denver. But, there is merit to Microsoft's decision to have lower detail since a larger number of users will have fewer problems. It is also important because Microsoft has nearly 50 cities with large numbers of 3D building data, and is adding several more every month or so. 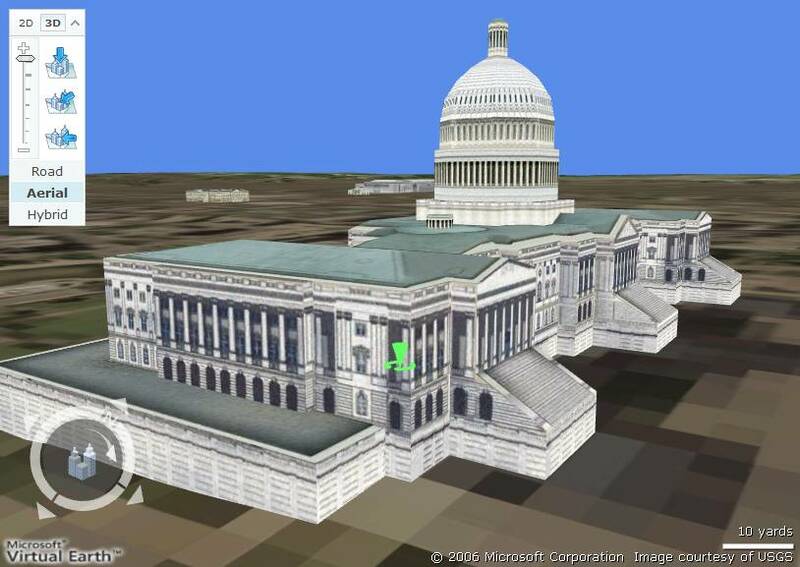 Here is a comparison of a hand-built model of the US Capitol building in VE3D verses the hand-built one in GE. Again, Microsoft has chosen much less model complexity, but the model looks quite acceptable. When rendering it's aerial and satellite photos, Microsoft uses a tiling approach which is very annoying to view as you zoom, pan and fly along. You can see "chunks" of imagery load and unload as you move along. GE's graphics engine has been refined over the past several years, and the algorithms and technology seem more pleasing to the eye. Transitions between imagery is more smooth. Microsoft licensed the rights from a company which has a patented method for taking not only normal straight-down aerial photography, but also oblique Bird's Eye views. And, Microsoft acquired a company whose cameras are ideal for this application. [Corrected based on comment.] When they capture a city, they have a top-down view - plus FOUR views from the North, East, South, and West. The Bird's Eye views are very high resolution and are a great resource for different perspectives. These photos are also used by Microsoft to auto-generate 3D buildings for a city. The Bird's Eye views are a major asset, but they are not as well utilized because the concept, and user interface, I think is difficult for the average user to understand. Google has no real equivalent to the Bird's Eye views. Microsoft's technology for automatically generating 3D buildings is a decided advantage over Google's approach for capturing entire cities in 3D - at least today. Microsoft has already released about 50 cities with 3D building data. This is definitely goodness. The amount of 3D Building data is impressive in scale, and quite decent in quality until you get closer to the buildings. Google has been asking the community at large to build 3D buildings and share them through their 3D Warehouse. Thousands of buildings have been created all over the globe and the models eventually can become a part of GE's 3D Building layer. This approach seems to be working to a degree, but only a small percentage of a typical city will get built typically using this approach. Most people aren't going to want to take the time to render every building on every block. Also, the quality of the models varies. Google is planning to announce they are licensing technology which will enable them to automatically generate 3D buildings at Where 2.0. In this area, Google will be playing catchup. But, they will have the advantage of both approaches once the new technology and data is in place. Microsoft's decision to support lower resolution textures is good from the perspective performance and better support for people with slower/older machines. Google's higher quality buildings look better when viewed up close, but at a potential performance penalty if you have a slower/older machine. If you have a new machine, GE will typically give you the same or better performance and the better quality buildings. Virtual Earth does not have many other kinds of data layers. They have the "Maps" and "Hybrid" layers which show roads an road label information and borders and country names. And you can load other "collections" of information from other people. But, there are not a lot of other kinds of layers. They also have some tagged information for points of interests like restaurants, but not wide spread information in this area. Google has a huge number of built-in layers for things like roads and road labels, and borders as well. But, Google goes MUCH further with all kinds of points of interest layers: Airports, railways, ferry routes, restaurants, lodging, etc. Also, data from a number of organizations like National Geographic Magazine, Discovery Channel, UNEP, AIA, and much more. That's all the time I have for now. 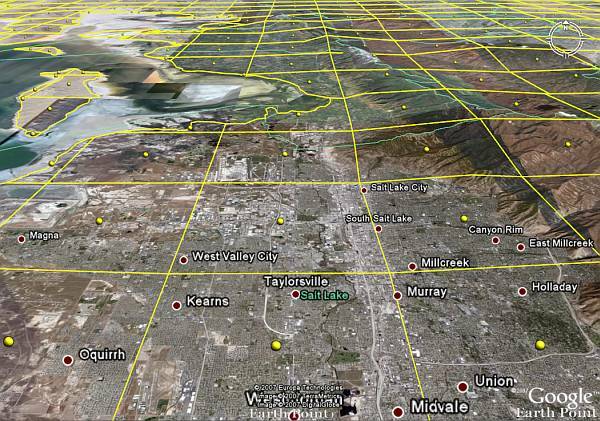 If you are a serious Google Earth user, you might still want to give Virtual Earth 3D a try. Just be aware that you have to have Windows XP SP2 or Windows Vista to be able to use VE3D. It doesn't work on the Mac OS X or Linux. By the way, to do a really cool direct comparison of these two products, check out Globe Glider. The 3D buildings collections Microsoft has done are very impressive. And, the Bird's Eye views with the VE2D application are definitely worth exploring as well. For pretty much everything else, at this point, I would recommend Google Earth. 'Nuff said. Last night, the San Jose Mercury News reported (registration required) that Google is licensing technology from Stanford University which will enable it to produce 3D building models automatically. The technology comes from robotic car technologies developed by Stanford which won the 2005 DARPA Grand Challenge. In that race, the Stanford robotic car drove 131 miles through a New Mexico desert autonomously. The technology will enable Google to capture shapes and photos of buildings and allow them to automatically generate 3D building models which can be viewed with Google Earth. A Google spokesperson said they will make an announcement at Where 2.0 week after next. I'll make sure to report on this, since I'll be attending Where. Google's approach so far has been to use its popular, and very powerful, 3D modeling software SketchUp to generate quality models. The resulting models can look stunning inside Google Earth when built properly. Google created a 3DWarehouse where anyone can upload models. And, there are now thousands of buildings from cities all around the world viewable in Google Earth as a result. However, there are some drawbacks to this approach: 1) the models are built by many people and the quality and level of detail varies a great deal; 2) only the buildings which are more popular or of personal interest get attention - all the rest of the buildings of a city generally are not built. Google will probably take the approach of continuing to use quality hand-made models and the new automatically generated models will fill in the gaps for other buildings. I'm looking forward to whether they will show examples of the new technology's capabilities. Here's a picture of the Stanford car shown by Google during the 2006 CES Keynote by Google co-founder Larry Page. Hace tiempo a comienzos de Abril compartí algo divertido que hizo alguien de la CGE llamado 'Bzoltan' que mostraba el efecto que causaría el mar si subiera entre 1 y 100 metros. Se aprovechó del terreno 3D de Google Earth y la habilidad de poner polígonos 3D a diferentes altitudes sobre el nivel del mar. Digo "divertido" porque la verdad que 100 metros es algo medio difícil de que suceda, pero, ciertamente que este tema tiene serias implicancias detrás. Bzoltan utilizó una simple esfera y la capacidad de GE para animar en el tiempo, para permitirnos tener una aproximación dinámica de lo que podría suceder. Y, sólo para divertirse, también lo hizo con el Cañón del Colorado, permitiéndonos ver cómo quedaría lleno de agua. There's been a lot of talk in the IT community about Google Co-Founder Sergey Brin's marriage to Ann Wojcicki. The location of the wedding was kept secret - even to the wedding guests until they got on the private Google jet. They were flown to the Bahamas and the ceremony was held on a sand bar, which you could only get to by swimming or by boat. The groom, bride and guests wore swimming suits. According to ValleyWag, the wedding was held off Musha Cay - which is an island owned by illusionist/magician David Copperfield. 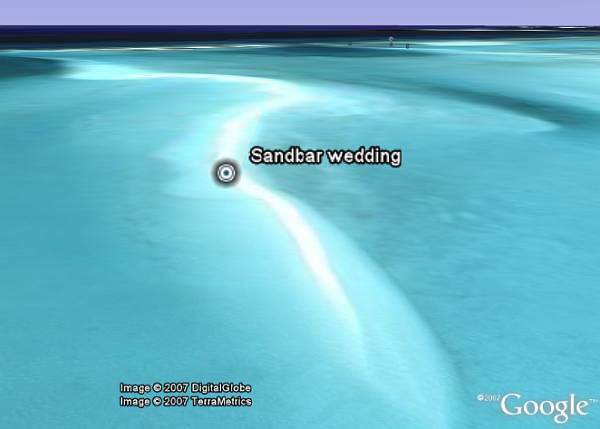 I did a quick search of the satellite photos in the area and found Musha Cay here , and I believe this is the location of the sandbar wedding (see it in Google Maps here). More information on the wedding from the Mercury News (registration reqd). Oh, and check out some photos of the Musha Cays from Google Images. Amsterdam 3D - As mentioned yesterday, Amsterdam has lots of 3D buildings. Most of the city is covered with very simple gray block buildings, but there are a few new high resolution buildings. I saw a blog entry from the Netherlands which alluded to the city having shared their GIS data for over 150,000 buildings, but I haven't verified its authenticity yet. Read my post for more details. Here is a YouTube demo of the new Amsterdam buildings via Nederkaart (Dutch). Forest Service - Check out the new sub-layer under the "Parks and Recreation" called "USDA Forest Service". The layer includes outlines for the borders of all the national forest areas, nicely done placemark descriptions for each area with photos and links to more information, and - as you zoom in closer to each area - more placemarks appear showing campsites, ranger offices, winter recreation areas, lookout towers, and more. A very handy way of learning more about US forest areas! This layer goes really nicely with the "US National Parks" layer (which is right below it). Taiwan Roads - Taiwan now has detailed roads if you turn on the "Roads" layer. Google just added detailed roads in Google Maps for Taiwan and a bunch of other countries at the end of April. If they already have added Taiwan to Google Earth, then the other countries can't be far behind. Panoramio - One GEB reader (named Siemen) says the Panoramio layer was updated. Digital Globe logo - The Digital Globe satellite photo layers now sport a new logo when viewed in the layers pane. Minor little addition. The DG layers show where photos have been taken by the satellite company over the past few years. Giant Building Removed - The giant building someone posted in the 3DWarehouse in Bratislava which got included in the 3D Buildings layer, has been removed. So, why so quiet? Last year Google did major new announcements of new data and layers just before the Google Geo Developer Day and anniversary of the release of Google Earth. 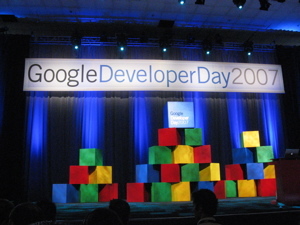 I suspect they are doing something similar for this year's Google Developer Day on May 31. There hasn't been an imagery update since March - so they are definitely saving up for that. So, look forward to a LOT of new data in about two weeks! 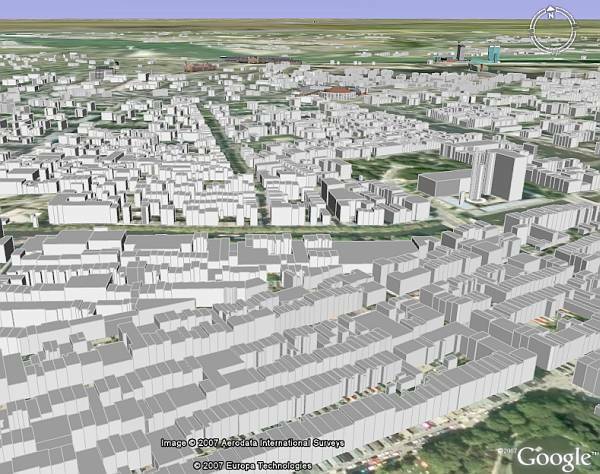 Google has just released 3D buildings for the entire city of Amsterdam in the Netherlands. 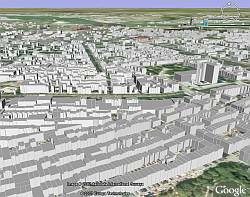 To see them, fly to Amsterdam , then turn on the "3D Buildings->Other buildings" layer in Google Earth. The building models are those simple, gray colored, type of models that give you an idea of the size and dimensions of buildings. Just like the 3D buildings that Google Earth first released almost two years ago for 35 US cities, and then later for most of Japan. These buildings will undoubtedly be used for the 2.5D views shown for Google Maps to provide an feel for buildings in major cities. They haven't pushed the ones for Amsterdam into Google Maps yet though. If you turn on the rest of the 3D Buildings layer, there are some new buildings for Amsterdam modeled with better quality as well. I guess its appropriate to give Amsterdam some special attention. After all, according to reports, half of all Dutch people use Google Earth! Thanks to GEB reader Erik for the tip on Amsterdam. He was the first to report on this interesting new find. I'm sure there are other updates to the layers, but I'll report on what they are in a later post. In the meantime, if anyone finds other cities which now have 3D buildings like this, please post a comment. I've already checked a dozen or so European cities, but this is the only one I've found. Ok, this is just too weird. 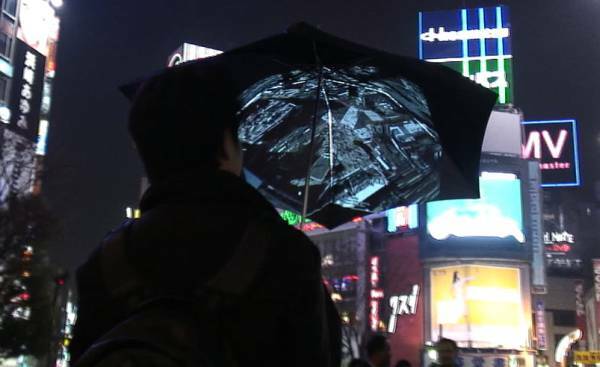 Some students in Human-Computer Interaction Design at Keio University, Media Design, Okude Lab in Japan, have developed an umbrella for viewing Google Earth. The umbrella has a GPS, computer, WIFI, and a projector built into the handle. 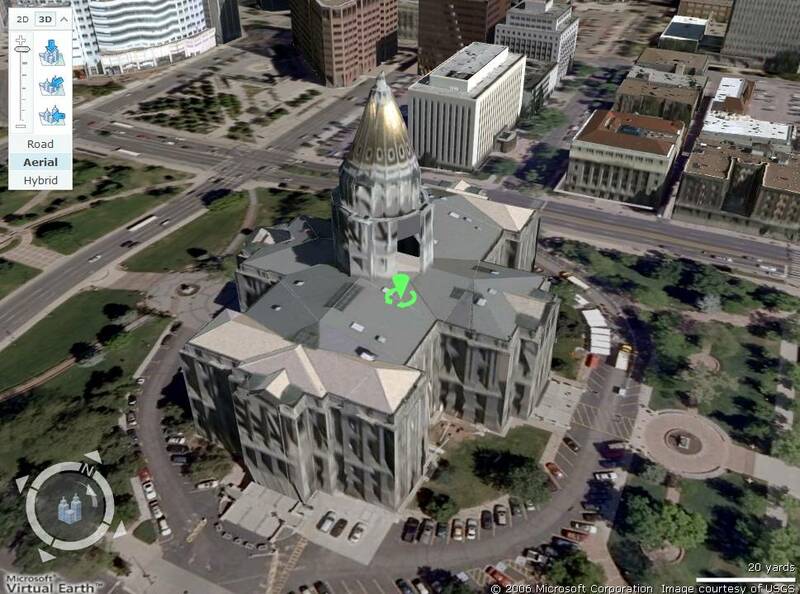 You can walk around places and view your location on a portable "dome" with Google Earth. And, you're protected from the rain at the same time! (No word on whether the devices are water proof or shock proof.) You can also use the umbrella to show photo slideshows with a simple twist of the handle. Visit the web site about the Pileus Umbrella. My hat is off to these guys for coming up with an innovative experiment with technology. It may not be practical, but its still an interesting idea to explore - especially the use of a portable dome in the form of an inexpensive every day object. And, of course, since they used Google Earth, they get extra points! Un ambicioso programador alemán decidió escribir la palabra "Hola Mundo!". Aquellos de Ustedes que son programadores saben que, usualmente, los primeros códigos que uno produce son aquellos que te permiten imprimir las palabras "Hola Mundo". Ha sido una tradición entre programadores por varias décadas hasta hoy en día. Este muchacho decidió mostrar las palabras en un campo de maíz para que fuera visible en fotos aéreas. Sólo que decidió hacerlo en formato Código Sema (un código visual - o código de barras - conteniendo información). Los Códigos Sema son usados para compartir URLs, por ejemplo, que son leíbles por máquinas. Encontró un campo de maíz y lo aplastó de manera que el Código Sema fuera visto desde el aire. Luego le tomó una foto desde un avión. Una máquina podría leer este código gigante y obtener las palabras "Hola, Mundo". Puedes leer su descripción del proyecto, o visitar su página web. Aquí está la Imagen Superpuesta mostrando el Hola, Mundo en Google Earth de su foto aérea. El Código Sema resultante es más o menos un cuadrado de 160 metros. Su Imagen Superpuesta se mezcla muy bien con la imagen de fondo de GE. También recomiendo revisar su Photo Diario Flickr mostrando este proyecto. ¿Un auto volador? Tú decides..
gCensus US - gCensus is a web application which got a lot of attention in early March for allowing access to the full year 2000 US Census data for 3 states with visualizations in Google Earth. Now Imran Haque, the Stanford PhD student who develops the application, has added data for all 50 states. Check out the gCensus site here. You can read more technical details about what is now availabe in his blog post about the update. Greensburg Radar - A Google Earth Community member managed to capture the weather radar sequence which shows the storm which passed over Greensburg, Kansas and destroyed the town with a huge F5 tornado. He created a GE time animation where you can see the intense storm pass over Greensburg (enter "Greensburg, KS" in the search window to see the location of the town, then hit the "Play" button on the right side of the time slider). His post also contains some high resolution radar images. And finally, check out the image overlay Google has posted with image overlays showing Greensburg before and after the tornado. The new Google Earth 4.1 beta which was released two days ago has something new which I think is important to highlight. Those of you who speak these languages will now find the ability to use Google Earth in your native language: Portuguese, Dutch, Russian, Polish, Korean, Arabic, and Czech. 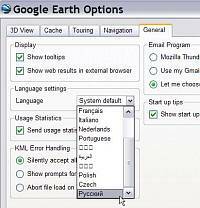 To use Google Earth in another language, simply go to the "Tools->Options->General" page and look for "Language settings". 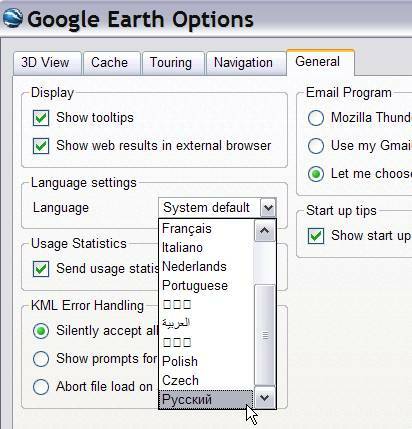 You will have to restart Google Earth after choosing a different language. The screenshot to the right shows what it looks like to make the change. Google is very savvy about supporting the needs of a global audience. They have an impressive language support capability for all of their applications. I am going to have to consider offering this blog in other languages. 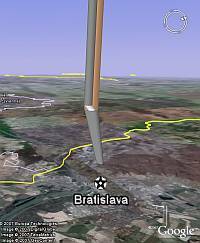 Found an E-mail from Jorge González this morning who told me he had found a 72 km tall building in Google Earth near Bratislava, Slovakia. Apparently someone has secretly built a space elevator in Slovakia - either that, or something wrong happened when a 3D model was put into Google's database. You only see this data error if you turn on the "3D Buildings" layer. Then, follow this link , or do a search for "Bratislava". I'm sure Google will have this corrected soon. Possibly when the next layer update occurs. There are already several 3D buildings built in Bratislava, it was my first time to visit the area. Jorge also has a spanish blog where he writes about things he finds in Google Earth - check out Turismo Google. 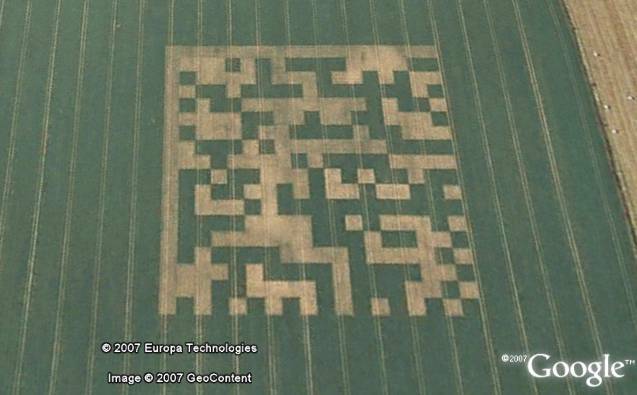 New Scientist Tech reports today on an interesting forthcoming application for Google Earth. This is something we really haven't seen yet for Google Earth. Bernie Krause has spent 40 years in the wild collecting sounds of birds, whales, wind, surf, animals, melting glaciers, and more. His Wild Sanctuary web site gives you a taste of what he has collected. Now Bernie says he wants to make more people aware of human activity on the environment by showing the sounds tied to location. I think this is a great idea. It would be especially effective if there is an elegant way to start up sounds by simply clicking on a placemark..
Krause plans to show 26 different sounds at a demonstration during the Where 2.0 conference - which starts on May 28th. I will be attending, and will definitely report on this when it is available. The same article mentions the Freesound project has some geotagged sounds. But, the network link for GE doesn't seem to be working at the moment. The more technically oriented folks here will be impressed by the fact the guys in the video have developed a way to project photos taken on the fly and map them into Google Earth in real-time. But, most of us will just think this is incredibly geeky. Read more about the SpaceNavigator (now available with GE 4.1 for the Mac), and about the company behind the video - Pict-Earth - David Ralliant (who also did the geeky remote controlled plane video) did this video. Spanish GE Blog - One of the Google Earth Community moderators called 'Dulce' has a new Google Earth blog in spanish. Here's an announcement post at the GEC. 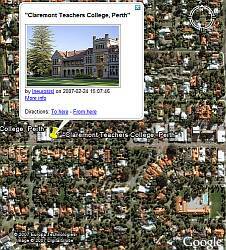 My Maps Embedding - DigitalGeography, an excellent resource for educators using mapping products, has a post about how to embed Google Maps My Maps on your web page. Misc - John Bailey, who works at the Alaska Volcano Observatory & Arctic Region Supercomputing Center, wrote a lengthy E-mail to me and Stefan of OgleEarth summarizing a bunch of cool things he's been quietly hiding from all of us. Stefan posts the entire E-mail with links to all the interesting things. I recommend reading it. One of the hidden gems in John's post was a cool video which was taken by David Ralliant of Pict-Earth. See the video in the next post. Google has quietly introduced a new blog for the Google Geo team (that's the Google term for the folks who work on the mapping products: Google Earth, Google Maps, Google Mobile, and the associated APIs). 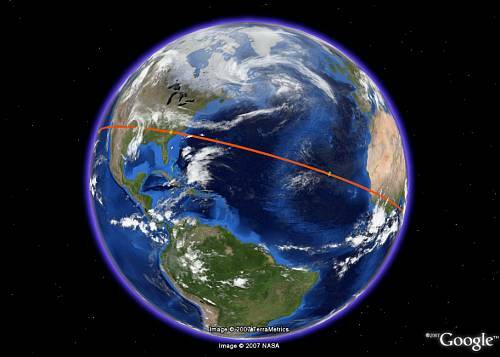 The name of the new blog is Google Lat Long Blog (as in latitude and longitude). The inaugural post is by John Hanke (who, before joining Google, was the CEO of KeyHole - the makers of the product which became Google Earth, and is now the Director of the Geo team at Google). He says their products are becoming more interrelated and evolving so fast, they felt publishing their own blog would be the best way to communicate with developers and users of the new mapping products and mapping-related search products they are working on. He also speaks a bit about the concept of the "Geoweb". The first real blog entry was by Brian McClendon, who is the Engineering Director of the Geo team, and he posts about the new Greensburg, Kansas imagery they released yesterday. Stefan at OgleEarth and Mike at GoogleMapsMania were the first to post about the new blog. Digital Globe has recently acquired a satellite photo of Greensburg, Kansas - the town which was destroyed by an F5 tornado last Friday night (see news reports). 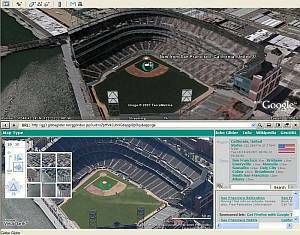 Digital Globe is the main provider of satellite photos Google uses for Google Earth. Someone at Google has quickly processed the Greensburg photo for viewing with GE. In order to make the photo available right away, they have posted this KML file at the GE Community forum. Once loaded, you will see the image begin to load. Zoom in for more detail. The KML file includes both a before and after version of the imagery (since the base imagery is lower resolution). The "after" photo (taken on May 7th) shows just how devastating this tornado was...it's awful! I see over 50 blocks which appear to be totally destroyed. Practically the entire town really was destroyed. Hopefully the photo will be of use to rescue workers. But, at this stage, it may be more important that this help accelerate aid to the citizens of this town who were obviously the victims of a terrible natural disaster. The Associated Press has published a story (picked up by all the news media) after interviewing Vice Adm. Robert Murrett, director of the US National Geospatial-Intelligence Agency (NGA). This organization oversees and funds sources of satellite photos used by both defense organizations as well as imagery for public consumption. 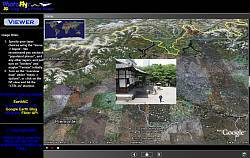 Digital Globe, the primary source of satellite photos for Google Earth, has already benefited from government funds. With the help of about $1 billion from Murrett's agency, Digital Globe, and its competitor GeoEye, plan to launch new satellites with higher resolutions later this year. Government regulations will require resulting satellite photos shared publicly from these satellites to be at a resolution no better than .5 meters per pixel. Interestingly, Murrett says: "I could certainly foresee circumstances in which we would not want imagery to be openly disseminated of a sensitive site of any type, whether it is here or overseas." He goes on to say they may exert "control over" imagery in some unspecified manner to sensitive locations. This could mean not allowing imagery for certain locations to be shared, or somehow altering imagery for those locations. Some industry experts believe it may be difficult for one agency to limit the dissemination of such imagery. 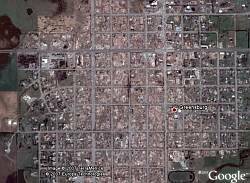 There are image providers now from several international satellite companies as well as aerial photographers. And the demand for high resolution photos for applications like Google Earth is increasing. "...this cat may be out of the bag for good. It's just not clear that the legal or other tools needed to restrict disclosure are available." So says Steve Aftergood, a secrecy expert with the Federation of American Scientists. I have been meaning to write a story about some of the significant improvements to Microsoft's Virtual Earth (VE) beta 3D application and data and how it compares to Google Earth. In particular, I've wanted to highlight the fact that you can now use 3DConnexion's SpaceNavigator with VE 3D and fly around just like you can in Google Earth (a big improvement for moving around in VE 3D by the way). I still plan to make a video demonstration and review. But, Dr. Andrew Hudson-Smith, of DigitalUrban Blog, has just posted some video showing some flying demonstrations with a SpaceNavigator in VE 3D showing the new 3D buildings of the entire UK cities of Brighton and Swindon. He also has just released one of Buffalo, New York. Microsoft's system of automatically generating 3D models of cities from complex multi-angle aerial photos, while expensive, is definitely producing some impressive 3D model results. The 3D models in Google Earth can have more detail and better appearance, but the volume of new buildings Microsoft is producing is impressive. Although it still only runs on Windows (they do now support the Firefox browser). I had been hearing a new version Google Earth was due soon. 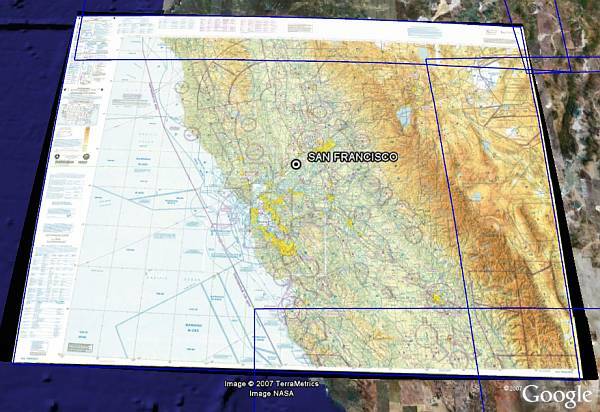 I knew this would be an important release to a lot of Mac users, because it would enable you to use your SpaceNavigator with Google Earth on the Mac! I've just gone to the Google Earth download page and installed Google Earth 4.1.7076.4458 (beta) for Windows, and the same version number for the Mac. The windows version file name is: Google_Earth_BZXD.exe. Again, here is the download page for the latest version. SpaceNavigator for the Mac - I installed the application, plugged in my SpaceNavigator, and it now works on GE 4.1! Yay! See my original review of the SpaceNavigator and a YouTube demo using it. The SpaceNavigator is a 3D Mouse device which lets you control GE like never before. Note: if you are just getting a SpaceNavigator for the Mac for the first time, you will need to install the driver first - available here. 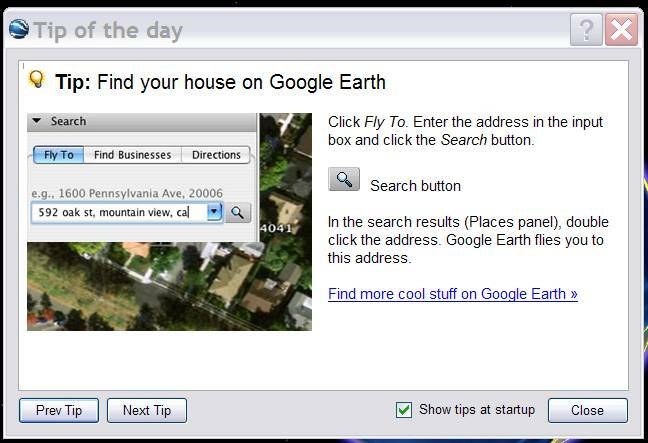 Tips - when you first open Google Earth 4.1 you get a "Tips" window which shows suggestions of things you can try, or instructions of how to use some feature in GE. See the screenshot. I think this is a handy way to help people learn about cool things you can do with GE. And, you can turn it off if you don't want it. Also, you can bring up the window any time through the "Help -> Start up tips" menu option. Nice addition! Starting Location - there is a new starting location added to your "My Places". I'm told by Google you get a different starting location depending on what country version of Google Earth you use. For me, I get a placemark for Lawrence, Kansas. View in Maps - this is a LONG-awaited new feature. At the top of Google Earth, where the tool icons appear, you see a new icon at the right which looks like a "map" - this button enables the new "View in Google Maps" option. When you click on it, it opens your browser window and shows you the same view in Google Maps. Finally, simple button interface to Google Maps from within GE! One difference is that Google Maps is always oriented north up, and you can't zoom as close as in GE. But, otherwise the new view button works perfect. New Installation Process - The installer for this version of Google Earth is MSI-based which enhances site-wide installations. I'm sure there are a few minor bugs and enhancements in the mix as well. Stefan Geens at OgleEarth heard about the file reaching the public earlier today... thanks for the tip! 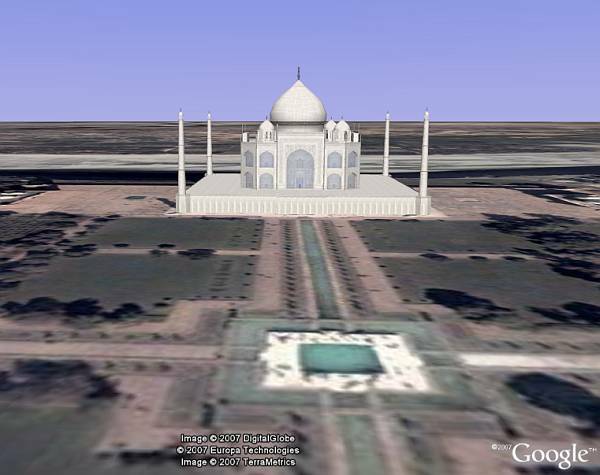 Taj Majal in 3D - GEB reader Jan Melin has posted a new 3D model of the Taj Majal to the 3D Warehouse. He has used photo textures to both increase realism and to make the file size reasonable. Load the file into Google Earth, or read his post here. KML as Open Standard - AllPointsBlog adds another update on the OGC standardization process for Google's KML file format. The post includes the preamble to an OGC "Best Practice" document describing the intent of the standardization process for KML which was written with Google's participation. Read the post here for more details. Katrina Imagery - You may remember the bit of unexpected media attention Google got when a few weeks ago regarding the pre-Katrina New Orleans imagery Google Earth had been showing for a few months starting last September. 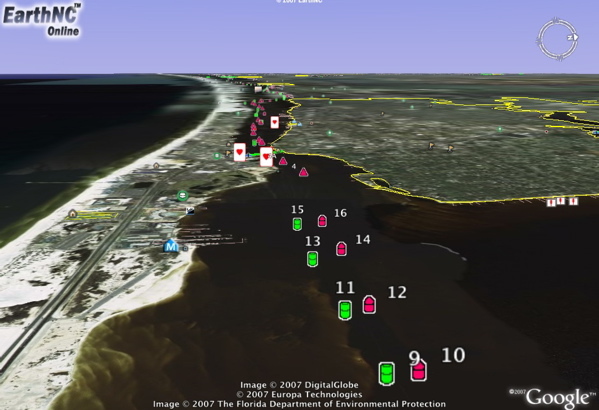 Google updated with post-Katrina, 2006, imagery a few days after the media storm. It was interesting to see that Google's popularity has resulted in media storms and even government requests (like the recent Chile border problem). Well, Henry Jenkins has written an interesting blog post about some interesting questions regarding the influence of a mainstream digital cartographical application like Google Earth and how it may influence the political environment around us. He reveals some interesting thoughts from a graduate student named Amanda Finkelberg who brings up the topics of data integrity and, in particular, discusses the situation with the Katrina imagery. 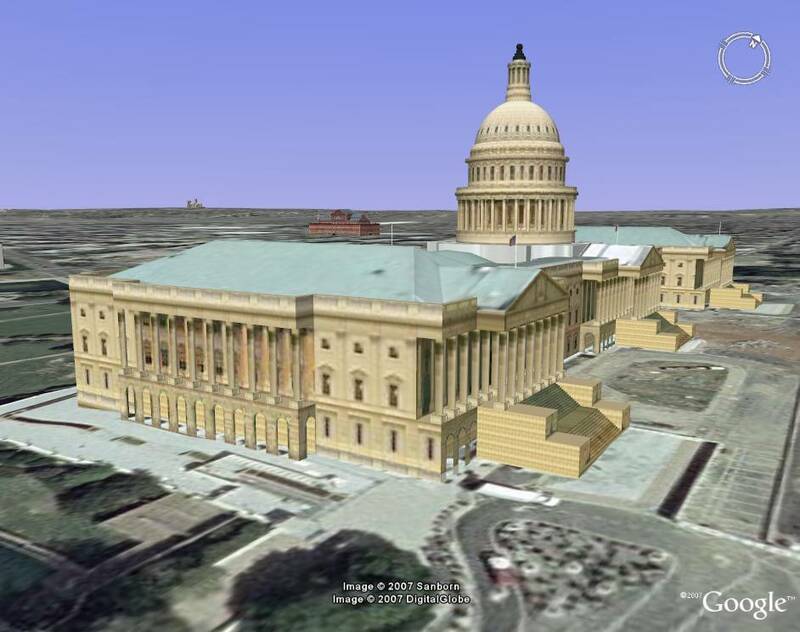 New AIA150 Tour - Google has released a new collection of placemarks that make for a nice tour of some of the more interesting 3D models from the American Institute of Architects layer. Make sure you turn on the "Featured Content -> American Institute of Architects" layer first, then download the tour (currently found at the top of the Google Earth Showcase page). Open the folder "AIA 150 Highlights" folder, and double click on the placemarks for different cities which will fly you to different unique buildings from the collection. See more about the AIA 150 collection here and here is a GEB video showing some of the models. If you would like to see place names in other languages, Google allows you to switch to a few languages - but, only after you exit and restart the application (which also changes your menus, etc. to that language). Someone at the Google Earth Community has been working to make it possible to see place names for many languages by simply loading KML files. PriceCollins, who also manages the Google Earth Data Error Compendium, has been working on this project for the past several months. So far, he has over 1300 placemarks in 80 languages. Included are country names, capitals, and other large cities. See the details in his thread of posts about the project. Only a few of the languages are translated for all the placemarks so far, but he is taking requests and asking for volunteers to do more. So, for many languages which are not yet supported by Google Earth, you can still see this valuable place name information in the language of your choice. Price has also created some very accurate global maritime boundaries data which is a companion to the placename project. The boundary data includes accurate placement of exclusive economic zones (which were described earlier here at GEB). Great work Price! Last night, Google quickly updated the French Election results layer. To turn on the layer, you need to select "View->All Layers" in the Layers window pane menu. Then you will see the "French Presidential Election 07" - turn that on. The layer now shows the election data for the whole country on who voted for Sarkozky verses Royal broken down by department and even down to the town level from May 6th. The placemarks show who voted for which candidate, and provide more detailed statistics. Zoom in and tilt your view for more details - it may take a few seconds to load individual town results - the towns actually show the results as 3D "columns" where the heights indicate number of voters. It is a good sign that Google is taking steps to update data for more timely geospatial related news like this. Maybe we will see more examples of this in the future. Science Visualization - Writer Tom Simonite wrote to let me know about his New Scientist article highlighting how scientists are using virtual globes like Google Earth for showing scientific results. Using GE for science is not new news to regular GEB readers (just look at the GEB science category), but its good to see mainstream magazines giving Google Earth recognition in this area. And, the article highlights some interesting new projects. Netherlands GIS - GEB reader Jarno wrote to tell about a discovery he made after reading a Dutch mapping blog about new GIS data available for the public for Holland. After experimenting a bit, he discovered a web mapping service was available to enabling him to generate a Google Earth file showing some of the GIS data. Check out his network link (sent to me by E-mail) which lets you zoom in to different parts of the area of Holland and see the results. Thanks Jarno! Avian Flu Map - This one made the rounds in the media last week. Some scientists at Ohio State University have created another Avian Flu visualization which shows the progression as it spread around Asia, Africa, and Europe. OgleEarth probably did the best job of describing why this phylogenetic visualization in Google Earth is interesting. Declan Butler of Nature Magazine has also been using Google Earth to show the spread of Avian Flu for a long time now. Nokia SportsTracker - GEB reader Frank B. wrote me because of his enthusiasm for the Nokia SportsTracker software. I had heard about this software because of the recent popularity of the Nokia 95 cell phone (with built-in GPS and good quality digital camera). Both GE bloggers Andrew Hudson-Smith and Stefan Geens have recently been playing with the N95 (so, maybe I should get one?). Anyway, SportsTracker is a GPS activity tracker and allows you to output to Google Earth. SportsTracker comes with the N95, but Frank says it's also available for any mobile phone which uses the Symbian S60 3rd edition OS. You can use other phones with the OS and a Bluetooth interface for a Bluetooth GPS device and use SportsTracker as well. Sometimes I get floods of E-mails for things to write about at Google Earth Blog, and I can't devote full time to review them all. So, I occasionally write News Roundups to try and give interesting content a chance to be seen. Education - While visiting last year's American Geophysical Union (AGU) conference in San Francisco, I met several educators using Google Earth to teach science in the classroom. Tavia Prouhet and Jerry Cook, who provide science curriculum material for middle school science classes, wrote to let me know about their two interesting science class room activities at the Joint Oceanographic Institutions web site here and here. Each of these has student guides in PDF format and an associated Google Earth file for visualization. Thanks Tavia! Clean Cruising - Australian-based travel agency Clean Cruising makes good use of Google Maps and Google Earth to help travelers learn more about destinations. I like the fact that they highlight environmentally oriented cruise itineraries with Google Earth files showing the route and highlights of the trip. 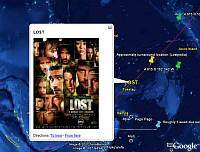 See for example their entry on this Alaskan cruise which shows a Google Maps version of the route on the web page, and also offers this Google Earth version for a real flying tour. 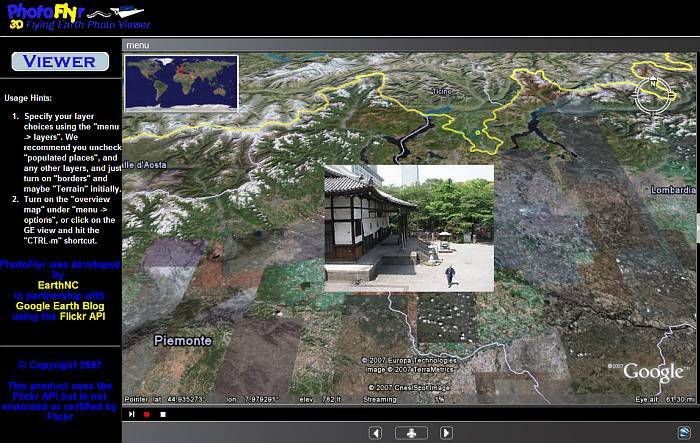 They also offer short video clips using Google Earth for a flying tour. More travel agencies should be doing this! Thanks Dan! Magnalox - Magnalox recently received some upgrades. Magnalox is probably one of the best, if not the best, tools for creating very interactive maps to show trip maps. It has all kinds of capabilities which are so powerful it is difficult to describe (see earlier review at GEB). Uploading a GPS track enables a wealth of possibilities with Magnalox, but you can build maps in other ways as well. Check out an example of a Magnalog. And, here's the Google Earth version of the same map - which is automatically generated for you. Thanks Volker! NASA UAVSAR - NASA, in usual acronymic fashion, has a project called Uninhabited Aerial Vehicle Synthetic Aperature Radar (UAVSAR). This mission will eventually use unmanned planes to fly highly accurate flights over areas of terrain on the Earth and map them using a super detailed three dimensional side looking radar system. They currently plan to start with a manned Gulfstream 3 jet for testing and then will begin experimenting with unmanned systems. NASA has developed a typical mission profile and Google Earth can be used to visualize a flight . Thanks to Bruce for the tip. The Google SketchUp guys sent me an E-mail last night to let me know they have published a new feature at the 3D Warehouse. If you are viewing a collection you now get a Google Maps mashup that shows you the locations of all the models in the collection. If there are too many models at the current zoom level it groups them into a different placemark. 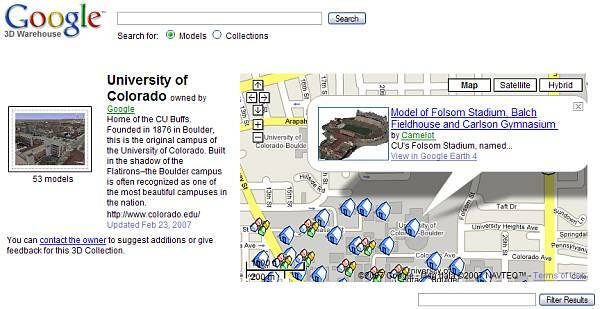 See, for example, the 3D Warehouse collection for the University of Colorado at Boulder. The icons and behavior mimics the same interface you get if you download the 3D Warehouse network link for Google Earth (which lets you view all the models in the 3D Warehouse in GE). The advantage is that these Maps only show the models for the specific collection you are viewing. I like the consistency in the user interface. The new Maps mashup lets you zoom in and see the better road map detail in Maps which includes the shapes of the buildings. Of course, you can turn on the satellite/aerial photo view and see the real buildings as well. There are times when you need an interactive map right next to the web content you are viewing, so I think this mashup with the collections is a good idea. If you click on the placemark of a model, you get a link letting you immediately view the model in Google Earth as well. See other example collections like: New York City, Las Vegas, Paris, or London. I've just suggested to Google that they should add a network link on each collection page so you can view just the models for that collection within Google Earth as well. As mentioned yesterday, I wanted to create a video demonstrating why I think Globe Glider is a super mapping mashup. Globe Glider in its basic form lets you get a strong sense of geospatial context by having two different map views (one can be aerial photos, the other roads; or one can be Virtual Earth, the other Google Maps) all within the same browser page. But, Globe Glider can also be used within Google Earth. The following video demonstration shows how it works. My favorite examples are showing Virtual Earth Bird's Eye views synchronized with a Google Earth 3D view, and then showing VE 3D synchronized with GE all done within Google Earth! (Please excuse the poor video quality, I loaned my usual video camera to a friend - so I had to use a small digital camera to make the video). The video is less than 5 minutes. About a month ago I was lamenting that Google had taken away a 3D model from the 3DWarehouse which showed the huge solar panel project planned for the Googleplex. Google will be adding 1.6 Megawatts of solar panels above most of their buildings at their headquarters. Even some of the parking lots will be covered with solar panels (also providing some shade for the cars). 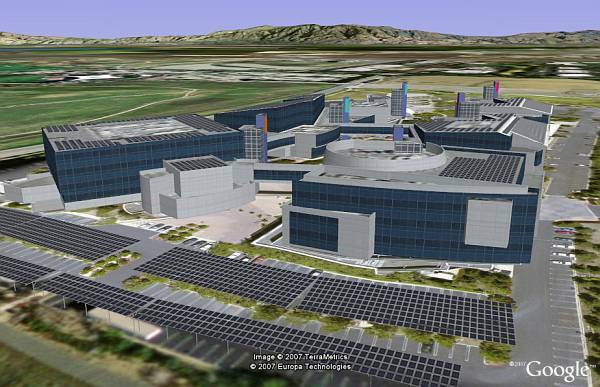 A couple of days ago, Google re-posted the 3D models showing the Googleplex with solar panels. 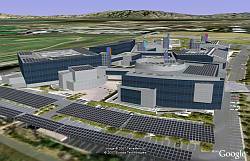 Download the main Googleplex buildings with solar panels , and you can also see some of the other buildings (which includes the offices where the Google Earth team members are located). The Google 3D Warehouse continues to grow with both user-contributed 3D Models for SketchUp and Google Earth. Google also has a team of 3D SketchUp modelers who continue to add high quality 3D models of places all over the Earth for viewing in Google Earth. Most recently, Googler Zach Moore has created a 3D model of Tian Tan Buddha - also known as "Big Buddha" - which is a famous religious landmark in China. 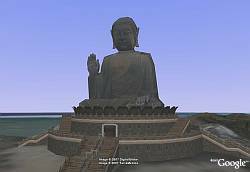 Big Buddha is located on Lantau Island near Hong Kong and sits at 34 meters tall (112 feet). The statue is welded together from 202 pieces of bronze. Zach also modeled the mountain top terrain so the stairs and statue are situated properly in the scene. 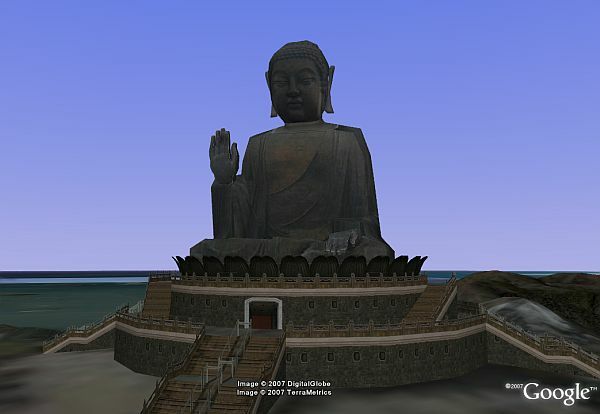 You can download Big Buddha into GE here, or you can view the 3D Warehouse entry.